A collection of striking and intimate photographs of Michelle Obama, coupled with personal reflections and behind-the-scenes stories from official White House photographer and New York Times bestselling author of Chasing Light, Amanda Lucidon, presented in a deluxe format for young readers. This stunning and revealing collection of seventy photographs captures and celebrates Mrs. Obama's White House years and her dedication to improving the lives of young people in the United States and around the world. As a former official White House photographer, Amanda Lucidon shares an insider's view on the role of the First Lady by documenting life at the White House and sharing personal memories that reveal what makes Mrs. Obama so special. These strikingly intimate and candid photographs through the lens of a White House photographer are a beautiful celebration and powerful reminder of the impact of a remarkable First Lady. Hey, everyone! 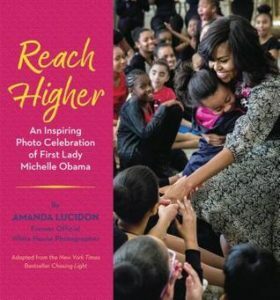 I’m SO excited to be on the blog tour for Reach Higher: An Inspiring Photo Celebration of First Lady Michelle Obama by Amanda Lucidon (October 23, 2018 by Crown Books for Young Readers)! Without further adieu, here’s my review! I’ve never reviewed a non-fiction book before – nor have I ever gotten political on here. But this book was absolutely amazing. It showcases Michelle Obama – a dignified, intelligent, kind woman who sacrificed her time and energy to make the world a better place. The pictures are amazing. Amanda Lucidon did an incredible job ensuring that these pictures would go down in history. I especially loved the last one, with Michelle and the family dog. It’s so light and carefree, showing us a different side of the former First Lady. I love the simple way this book broke down the job of the First Lady, the job of the official White House Photographer, and what the White House is – it makes it very easy for kids to understand. I also enjoyed the bits of historical facts – I learned things I never knew (or maybe once learned and had since forgotten), such as the fact that the White House wasn’t always called the White House, and that Dolley Madison was the first presidential spouse to be referred to as First Lady. In today’s violent and volatile political climate, kids need this book. They need to know that there are good people out there; that people in power are not all corrupt, and often DO have our best interests at heart. Kids need to know that Michelle Obama is a beacon of kindness, and a person who values humanity – ALL humanity. Kids need to know what we’re fighting to get back, and that the journey will be worth the struggle and sacrifice. I highly recommend this book to… basically everyone. But I especially think it will be great for teachers and librarians – a must-have book for classroom libraries and library collections. I recommend it to kids who need to understand where we came from and where we’re going, as well as for adults who need a reminder that their hard work will pay off – and that future generations will appreciate all they did.